On 17 October 2005, the band released their 11th studio album Playing the Angel. Produced by Ben Hillier, this Top 10 hit (peaking at #1 in 17 countries) featured the hit single "Precious", peaking at #4 in the UK charts. The album was backed by the band's first in-store signing since 1990, on the day of release in New York City. 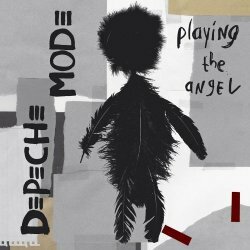 This is the first Depeche Mode album to feature lyrics written by Gahan and, consequently, the first album since 1984's Some Great Reward featuring songs not written by Gore. With a prototypical version having been leaked onto the Internet some months earlier, the official video for "Precious" was released on 12 September on the Depeche Mode website, www.depechemode.com. The second single from the album, "A Pain That I'm Used To," was released on 12 December, and the third single from the album was "Suffer Well," the first ever post-Clarke Depeche Mode single not to be written by Gore (lyrics by Gahan, music by Philpott/Eigner). The last single from the album was "John the Revelator", an uptempo electronic track with a running religious theme, accompanied by "Lilian", a lush track that was a hit in many clubs all over the world. Touring the Angel concert in Bremen (Germany) in June 2006 To promote Playing the Angel, the band launched the worldwide Touring the Angel in November 2005, taking them to North America and Europe. The tour continued through the first half of 2006. Depeche Mode also headlined both the 2006 Coachella Valley Music and Arts Festival, in California, and the O2 Wireless Festival, which took place on the last weekend of June 2006 in London's Hyde Park. Some of the gigs were their first ever shows in certain countries like Romania and Bulgaria. In March 2006, the website announced two dates in Mexico (a country they had not visited for twelve years). More than 55,000 tickets for a stadium in Mexico City were sold, causing the band to schedule another date for the same venue. On the tour following Touring the Angel (Tour of the Universe), the band have chosen to play only one song ("Precious") from the album.